Someone cue the marching band: another UFO (unfinished object) is complete. Behold the the long-time-WIP (work in progress) Scrappy-Trip-along is finished! This quilt was started over two years ago. I finally got serious about finishing it this past January when I became determined to start tracking and finishing all those (many, many…many) WIPS. This is such a fun project – a great way to use up 2 1/2″ wide scraps or to just bust through a lot of fabric stash. Bonnie Hunter wrote the original tutorial for this quilt and can be found here on her blog. I used red in every block and made it my center color to give the quilt some unifying design. One of the reasons I put this WIP away for a while is because the colors weren’t working for me. I just didn’t love it. The trick that gave this quilt new life was adding more non-matchy-matchy fabrics. Some more turquoise, different shades of red for the main diagonals, more ‘sour’ colors including gold, darker shades of green, etc. all made a difference. Picking a “zinger fabric” (or two or three or ten, when it’s this scrappy) can give some great life to a quilt. Since I wanted this to have an old-fashioned, rag-bag, kind-of-look, I had Melissa from Sew Shabby Quilting quilt it with an all-over Baptist Fan design. I love how much it really pops after I washed the quilt. The binding is also from my stash (*pats self on the back*). I love this bias stripe print. It’s also a couple years old from a Moda collection called Baby Jane. I was originally going to do a red binding, but it making myself stay away from the matchy-matchy-ness I decided to go with mustard/gold. The white stripes kind of lighten it up a lot which gives it a more subtle finish. I think I like it. I’ve been saving this yardage for a while now to back just the right quilt. This is that quilt. This fabric is an American Jane print by Sandy Klop for Moda from a few years back. I have a fun personal connection to this print (you can read here), so it’s fun to finally have it on a quilt. I used a few scraps in the quilt blocks too. I didn’t have quite enough yardage, so I had to piece a back to expand it just a little. Which is hard to really see here since we weren’t getting many great pictures thanks to the wind. Here’s another “good effort” try at getting a full-body shot of the quilt. Further proof that the wind had a mind of it’s own. Which just devolved into to this. I shared a few more outtakes last night on Instagram. (And that is how I learned about the #husbandsholdingquilts hashtag there. It is quite hilarious.) What would we do without our quilt holders? Fortunately the wind granted us one decent full shot. And there you go. Awesome quilt finish, Amy. Love the pictures of your quilt holder. What a great sense of humor! You did such a wonderful job on this quilt Amy! It is so beautiful! Great fun with the photo shoot too, I see :)!! Loved that you shared the ‘behind scene’ adventure! Lovely! And spot on with the quilting, it really compliments the quilt. Oh, that’s awesome. We love Zion NP! And fall is my favorite time there. Wow that is a beauty and a true test of your fortitude! Really lovely color work, my heart sings when I see such scrappy beauties. Thank you for sharing – so inspiring. It’s beautiful Amy — I love it!!! Love your quilt and your quilt holder too. I think the scrappy trips us best with that constant color through the centers. Another excellent finish…and post! I love that you brought a bit of continuity to it with the red. It really works and helps the eye. I laughed out loud last night when you posted the windy fun on Instagram. This morning I’m sharing these with my husband and he left for work laughing…which is a very good thing! Thanks. Great quilt! Thank for all the pictures. Kudos to the quilt holder (and to the quilter too!) – this is a great finish! Absolutely lovely!! I would need lots of patience working with all those 2 1/2 squares. I have been studying how you chose the placement of your fabric. Looks like it would be a great winter project. You’re such an inspiration to all quilters. I find myself checking my email to see if you have posted. Thanks so much! I’m addicted! Aww, thank you. That’s so nice! I see spring winds have hit your part of the country too. Love you scrappy quilt. Wonderful finish. Stash fabrics, scraps, and a completed UFO, has to feel amazing. I love how your quilt looks. For some reason I’ve been intimidate by the Scrappy Trip instructions but your quilt makes me want to try! I would just try a block – it’s one of those things that makes more sense once you actually do it. And after you’ve tried one, they get easier and easier after that. I just love this quilt Amy! I am motivated to start one now…….your husband has wonderful quilt holding skills;)! Blessings to you today. This is a perfect quilt, and in my opinion, exactly what quilting is all about! Congratulations on a beautiful finish. Love, love, love your scrappy quilt; it’s beautiful! Great post, lovely photos! I love this quilt! Reminds me of several family quilts my mom and grandmother made many years ago. The backing is beautifully modern! Love the entire project. Great finish and ‘holder’ shots. I am very intrigued by your inclusion of the term ‘sour’ colour choices. Would have never thought to phrase them as that! I look forward to seeing more of your UFO’s being checked off the list. Quilt On! Wow! It is wonderful. I’ve been wanting to make one of these since they started surfacing on the internet, but can’t say I’ve even started. I have finished other projects though 🙂 You are inspiring! Way to go! Okay so on top of loving the quilt, love the orange peel pillow. Di d you make it or buy it… where did you get it? I love the idea of it documenting your quilting journey! What a great idea. Wow – you got some great pictures after all! And it’s such a fabulous quilt in person too… Thanks for introducing me to #husbandsholdingquilts – Hilarious! You are so talented, and so amazing, and I just love you (and your quilts). I love how it turned out!! The bright red really ties all that scrappy goodness together without overwhelming it. You have a great eye for color!! You really made it work, Amy! I love everything about your perfect quilt, including the Baptist Fan quilting! Thanks for sharing the link to the original tutorial. The quilt is great and I LOVE the back. Love the whole thing. Your quilt,the fence, the mountains, green grass(none here in Maine yet), your sweet husband to pose for you :). Everything was just darling Amy. Love , love your quilt Amy! Dumb question…after reading the pattern where do you place the red fabrics in your sewn rectangle in order to get your look? I kept the red blocks in a diagonal line down the center of the block. That way they were consistent across all blocks. Gorgeous, like all of your quilts, Amy. Double pat on the back for another WIP wrapped up. You go! And love the new #husbandholdingquilt hashtag, too. So fun! Using the red that way was so smart (no pun intended..) It gives the eye somewhere to rest and adds a lot of visual interest. It’s a great quilt! I LOVE, LOVE, LOVE THIS quilt! The old-fashioned, scrappy ones are my favorites, and this one really fits that bill. I’ve heard this particular pattern called Many Trips Around the World. I made a Trip Around the World (using 30s repro fabs) that began in the center and continued with concentric trips to the outer edge of the quilt. That was 15 years ago, and I think it’s time I tried a Many Trips. Thanks for your always-inspiring, you-can-do-it attitude. Old fashioned, scrappy are my favorite too. And you’re right, technically it’s Many Trips. I bet a single Trip around the World in 30’s fabrics is fantastic! BEAUTIFUL! I understand why it was a WIP for a while. Worth the patience! Wish I had just a little of your talent… Keep the quilt holder…he does add a lot to the picture! This is one gorgeous scrappy trip around the world!! I don’t even have the right words to tell you how much I love this quilt. What a beauty. I remember when you first posted about that backing fabric. I can’t believe that was three years ago! 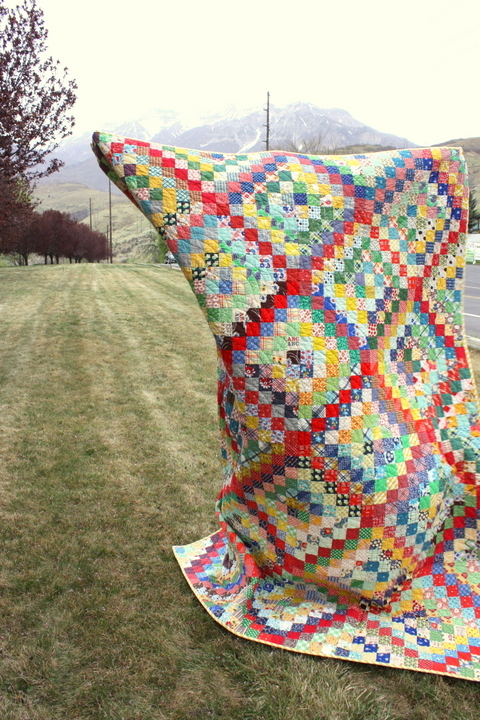 I love the windy quilt photos. Very real! I can’t believe it either!! 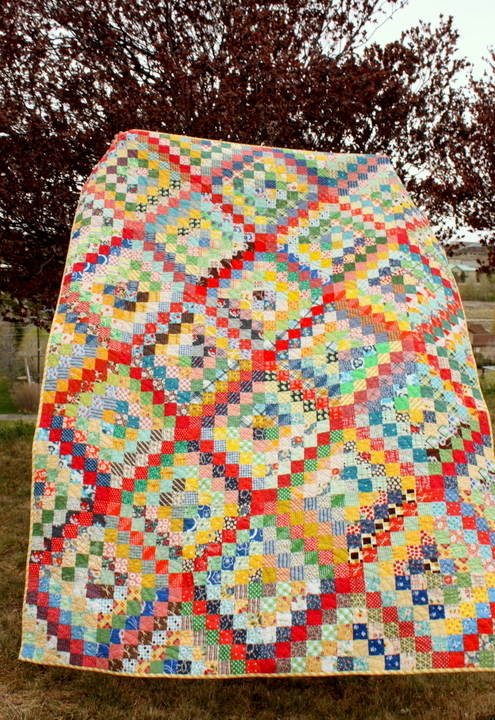 I love your quilt – the scrappiness is perfect and using the red to unify everything was a brilliant move!! Love your pictures too – your husband is a good sport!! Your quilt is irresistable! I love your selections of colors. I’m so glad you finished it so we could see it! I love your style, you have a good eye for color. The pic.s are fun and fabulous too. Such a wonderful finish Amy! Thank you for all the great color/fabric-choice tips. I’m new to quilting and really appreciate all the lessons you are willing to share! Thanks! Love your scrappy trip quilt….and I really like the deliberate placement of the red fabrics…gives just the right amount of structure to the blocks while still keeping the entire quilt scrappy! Beautiful finish!! My favorite Scrappy Trip so far. Nice job. The red unifies everything so well!